It can be a frightening experience when you are driving down the road and your tire goes flat. Many don't know how to change a flat tire. Because MINI of Charleston wants you to be safe when you are out on the road, here are some tips on changing a flat tire. First of all, you need to drive your vehicle to a safe location. Pull into a parking lot away from traffic if at all possible. You will then want to get the tools that you will need to change the tire. 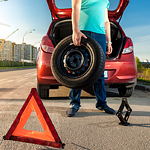 You will need your vehicle's jack, tire tool and the spare tire. Before jacking the car all the way up, loosen the lug nuts. Jack up the car, and remove the tire. Place the spare tire on the wheel. Lightly tighten the lug nuts, and lower the car. Fully tighten the lug nuts when the spare tire is on the ground.